Moving home is one of the most stressful activities a family can experience. We at Maze removals would like to provide you with the following tip to make that experience less stressful. Planning your move: The sooner you plan your move the better. After you have decided on which day you would like to move create the following check list. 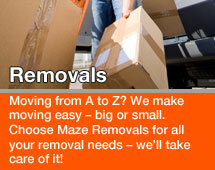 Appoint a removals company like Maze Removals by looking online or ask your friend to recommend a reliable company. As soon as you have decided who you would prefer to use make a booking with them a.s.a.p. Sort out what furniture and appliance will be going with you and arrange to dispose of the rest either via selling it on ebay (www.ebay.co.uk) or gumtree (www.gumtree.co.uk) or even freecycle (www.freecycle.co.uk) where people will take just about anything that you list! It's a good idea to colour code the boxes with stickers. Each colour representing a different room. Eg Main bedroom red. Kitchen Yellow ect. Parking. Do you need a permit? You can organise this through your local council. Just give them a call and get 2 bays reserved for the day of the move. This is normally the Client's responsibility and any parking fines might be charged to you! Walk through your house one last time to make sure everything is accounted for. Make sure you are present when the removal crew arrives so you can guide them around the house confirming what is to be moved and any special instructions. Start with the essentials – do you have power, gas and water, telephone and internet. 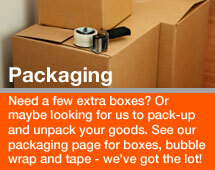 You can instruct the movers to place your belonging where you want them. That way all you have to do is unpack. That's it – your in. Have a cup of tea. Give your movers a nice tip or pat on the back and enjoy your new home. 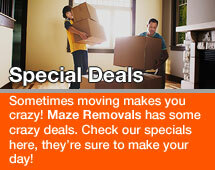 Maze Removals has a solution for all your moving needs. 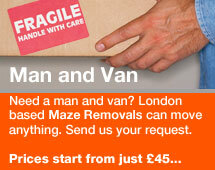 Get a free quote or call Maze Removals on 07847541036. We’ll take care of the rest.